If the cover art weren't a clue, Perrin takes center stage in this volume with a final confrontation with the Whitecloaks under Galad. This is something that has been brewing since 'The Eye of the World', so it was very satisfying. Perrin's and Galad's plotlines conjoining puts Morgase into an interesting position. Perrin also faces down demons of self-doubt, and a Forsaken or two with varying results. Faile and Berelain Work It Out and we can truly lay to rest the ghost of the Plotline of Doom. As a united force, Perrin's forces march towards the Last Battle. Mat has reached Andor and must delay there until he either opens a letter from Verin, or he receives instructions from her. While he waits he strikes a deal with Elayne for Andor to start building Aludra's dragons. Elayne also has to get Queenie on Perrin for awhile. Long standing darkfriend/Black Ajah threats come to a head and some rash decisions are made. Mat is awesome, and less problematic than he was in 'The Gathering Storm'. As with Perrin, a long-standing animosity - in Mat's case with the Snakes and Foxes - is dealt with on a rescue mission with Thom and Noal. Egwene and a united White Tower face down the lingering Forsaken threat - and something else - and take to the World of Dreams, with some unwitting assistance from Perrin engaged in battle with another old nemesis. The White Tower is whole and can prepare for the Last Battle, but now it must try to decide how they solve a problem like the Dragon Reborn. Rand still holds on to his new zen-like state and heads to Arad Doman and then Saldaea to take care of unfinished business, and make amends. With the help of Min he begins to form a plan that could make the coming confrontation with the Dark One the last. Meanwhile Aviendha sets out for Rhuidean to become a Wise One. There she experiences the past of the Aiel, but is given something else, also. A vision of the future that changes much. And then, at the Black Tower (FINALLY, we get a picture of what's going on), some people are troubled by the constant echoing laughter and rubbing of hands. Androl, a Dedicated with a bit part in 'Winter's Heart', becomes the central figure there along with Pevara of the Red Ajah. As with 'The Gathering Storm', 'Towers of Midnight' (I don't fully understand the name) is clearing away old plotlines and advancing timelines so that all of our main characters are in sync at the start of the Last Battle. Sanderson does the best job that any writer could have, frankly. There are some reunions that we don't get to see and a whole lot of unanswered questions - but this is the penultimate novel we got and its pretty damn good. This is the book that truly returned this series to fulfilling its potential, at least for me. Numerous story lines and subplots are finally wrapped up to clear the way for the Last Battle. Perrin has finally stepped into his role and begun to accomplish what he was responsible for all along. Mat has returned to his irreverent character while fully accepting his role as a reluctant hero. Rand has truly embraced his role and begun the leader that was needed. Beyond these three main characters there was a powerful, though short, subplot involving Aviendha. Her visions of the future serve as a reminder that the Last Battle, while necessary for the survival of all, does not guarantee the survival of all. Egwene alternated between a competence and arrogance. She is a competent leader in the White Tower and demonstrates her skill at both politics and battle. However, her treatment of Gawyn is belittling to him and unbelievably irrational. While she accepts the need to moderate herself before sisters, she demands almost unquestioning obedience from Gawyn, even when she has not ordered him to do something. She grows angry and frustrated when he does not act in accordance with her unannounced wishes. Her treatment of Rand is similarly disheartening as she assumes that his course of action is wrong with out analyses or review. Elayne is similarly frustrating and continues to serve largely as a waste of attention in this series. Her political maneuvering is mediocre, though it is painted as genius in the story. However, this is all somewhat unraveled in her treatment of Perrin. By threatening Perrin she overplays her hand to gain exactly the fate she is attempting to avoid. Her standing with lords appears to be more important that taking a course of action that is necessary to prevent blood shed, and she seems blind to reason solely because her prerogative is not accepted unquestioningly. Brandon Sanderson has done a wonder with the female characters in this story, though there was only so much he could accomplish with the frustratingly arrogant and one dimensional creatures created by Robert Jordan. The author change did improve the quality of the writing in the sense of cutting down the purple in the purplest of proses. But as a downside of the improved craft, it highlights the disturbing content of the writing. The misogynistic taint that undermines the so-called-but-not-really-powerful-after-all strong women of the series. The ridiculous premise of gender determining and distinguishing how people use and control the fantasy magic. That this is nothing but the boyz's story. The harmful allusion that insanity can be cured. All the things I've mentioned before and conveniently forgotten. 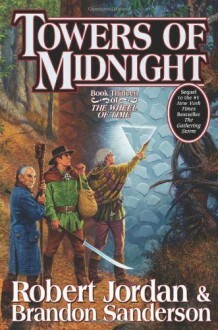 And to add insult to injury, the White Wizard of The Wheel of Time series doesn't save herself but is saved by three men. I hope Jordan is enjoying his reborn life as a woman who hates all things Wheel of Time. P.S. Still shipping Mat and Birgitta. ...how much I hate this book's (series', authors) attitude towards pregnant women? Not to mention the subtle undermining of female authority in all forms. Caution: This review contains minor spoilers. 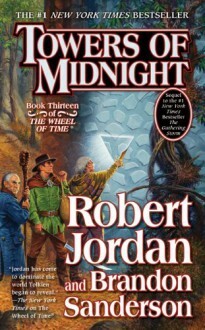 I have the impression that Brandon Sanderson, who has done an outstanding job with the Herculean task of finishing Robert Jordan's epic, The Wheel of Time, is tremendously fond of Perrin Aybara. I have this impression because there's an awful lot of Perrin in this book. 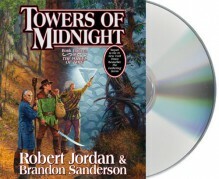 I didn't count the chapters, but trust me: if you like Perrin, you'll like Towers of Midnight. I don't dislike Perrin, but at this point in the story, there are several plot threads with rather interesting content, and I find most of those more engaging than his story. There's one in particular that I was dying to know about, and after 700 pages of mostly Perrin, I was getting extremely impatient. I won't post it here because it's too spoilery. 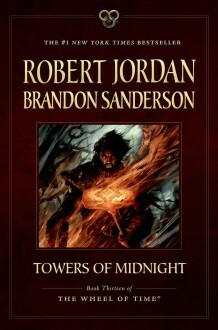 That's my primary complaint about Towers of Midnight, and it's why I'm giving the book four stars instead of five. I actually prefer the way Sanderson writes many of the characters, and if it had had more of any other character to balance the Perrin scales, I'd give it a higher rating. On the plus side, Aviendha gets one of my two favorite scenes in the book; Mat gets the other. Again, I'll say no more, because they're both major spoilers. PS: I still detest Tuon. I despise the way she treats Mat.